This Creepateria™ set -- that comes with Draculaura™ doll -- lets girls play out favorite scenes from the webisodes. Ready for all the ghouls' lunch needs, the Monster High™ cafeteria features scary cool play spaces and pieces. Fill a monster appetite with an order from the Creepateria™ food counter with its working guillotine sandwich slicer. Draculaura™ doll can use it to “slice” the two sandwich halves. Grab a ghoul a tray for the monsterrific food, and don’t forget a drink. An extra shelf under the counter provides storage and play space. 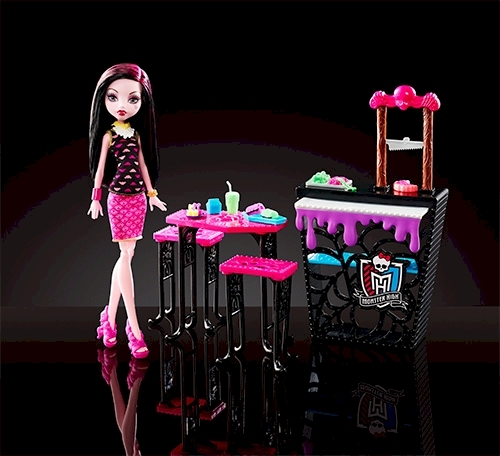 Draculaura™ doll can enjoy her meal at the coffin-shaped Creepateria™ table that has two matching stools for a lunch date -- it's in her favorite colors: pink and black. She looks boo-tiful in a skirt and top with complementary patterns, bright colors and to-die-for accessories. Collect dolls and other school accessories (sold separately, subject to availability) to build out your Monater High™ world! 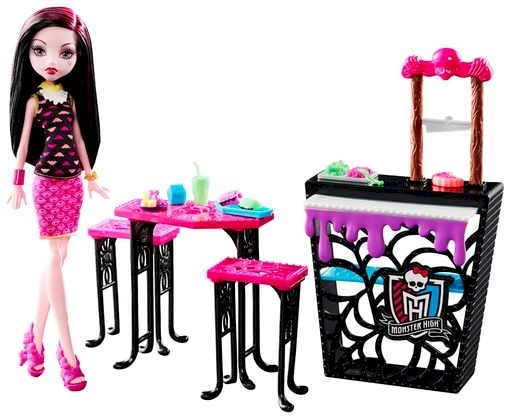 Set includes Draculaura™ doll wearing fashions and accessories; Creepateria™ food counter with working guillotine; one café table and two stools; and cafeteria-themed accessories like a lunch tray and monster-themed food and drinks. Doll cannot stand alone. Colors and decorations may vary. Features: Play out exciting Monster High™ Creepateria™ scenes with this freaky fabulous play set! The Creepateria™ comes with a favorite student, Draculaura™ doll, as well as a food counter, café table, two stools and themed pieces. Draculaura™ doll looks boo-tiful in a skirt and top mixing bright patterns and colors and accessorized with matching pieces like heart-detailed shoes and jewelry. Fill a monster appetite with an order from the Creepateria™ food counter with its working guillotine sandwich slicer that can “slice” the sandwich into two halves. Dine at the café table and two stools designed in pink and black with iconic details like cobwebs. Fill the coffin-shaped lunch tray with fun food choices. Cafeteria-themed accessories include a lunch tray, monster-themed food and drinks. MONSTER HIGH and all associated trademarks and trade dress are owned by Mattel.